And no, you don’t need any cheese to achieve this creamy texture and full flavour! I usually just make it with vegetable stock cubes but lately have been using my gut-healing vegetable broth which is not only more nutritional but adds a wonderful flavour. I also recommend mushroom stock, if you happen to have some. 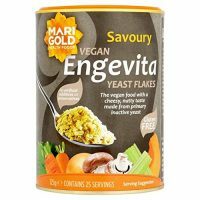 For a subtle cheesy flavour, I often add nutritional yeast – you can buy this in health food stores or online but don’t worry if you can’t find it. It’s still delicious without it! Heat the olive oil in a large saute pan. Add the shallot and garlic and cook on a medium-low heat until softened. Add the mushrooms and cook for a further minute. Stir in the risotto rice and immediately pour in the stock and vinegar (if using). Bring to a boil then reduce to a simmer for approximately 30 minutes or until all the liquid has been absorbed and the rice is cooked. Add more hot water, if necessary. Once cooked, stir in the nutritional yeast (if using), stir in a handful of chopped fresh parsley and season with salt and pepper. 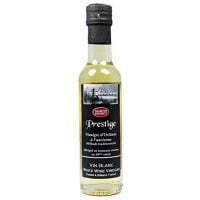 *White wine vinegar adds extra flavour but it still works well without it. **Nutritional yeast adds a cheesy flavour but again, still works well when left out. I'll admit that I'm a skeptic when it comes to vegan substitutes, and when I went to buy the nutritional yeast I was even more skeptical. Consider me swayed. It's delicious! I can't believe how cheesy and rich it tastes. I can't wait to make it again! So pleased you enjoyed it, Hannah! I was also very skeptical when I first tried nutritional yeast but now I'm hooked and put it on everything. Made this recipe because I have been vegan since I had heart surgery 2 years ago and wanted something simple for dinner a little risotto anssome salad. I added peas to my risotto at the end. I used whole grain risotto rice took longer and more liquid to soften rice but once it was done it was delicious with my salad. Had leftovers for the next day and I it with spinach and kale. Wonderful. I recommend this recipe to anyone not just vegans. Makes a wonderful side dish. It was good but the portion size was so small. I will make it again but double the recipe. Delicious!! Made this recipe tonight for my boyfriend and I as we are trying to incorporate more vegan meals into our life. Let me tell you, this recipe did not disappoint. I was really nervous too when adding the nutritional yeast (never heard of it before) but I’m so glad I did! Did not add the white wine vinegar because I forgot to buy it, but it was delicious without. Thank you for such a lovely, easy, vegan recipe! I will definitely be saving it! I'm new to being dairy free and I didn't know if risotto would taste any good without a hefty whack of parmesan but this does. I included the white wine vinegar and half of the recommended nutritional yeast. I also substituted the parsley with fresh chives and stirred through chilli flakes at the end. This is easy to make, tasty comfort food! I love the recipe it's really good and it is creamy, I used the nutritional yeast + rice wine vinegar and add carrot. Turns out really good, I will definitely make this again maybe add something else, to me its missing something, I know its vegan recipe but I think I will like it better with adding bacon or chicken. This is freaking amazing. I'm newly vegan (going on 1 week woohoo!) and I decided to try this out. I've never made risotto before so I was kinda scared but it was so easy!! I added some soymilk into it after most of the stock was soaked up and ohhhh my gosh it's so amazing. I'll have to try it with the yeast next time too! I'll definitely be making this again! Can I make this the night before and bring it as a school lunch the next day? This is the first risotto I have ever made. It was do easy and we just loved it. This was delicious! I could have easily had a second portion and my 3 year old daughter cleared her plate. My fiance is not a lover of risotto and even he gave it two thumbs up, will definitely be a regular in our house. We kept to the recipe, using the nutritional yeast but no vinegar. Only complaint was that the portion was too small for something this tasty, will definitely double up next time! Wow wow wow. I’ve never cooked risotto before, the thought of it scared me abit! But that was soooo simple and super tasty! Thank you so much for sharing :-). Cook with or without a lid? i cooked mostly with the lid on, but very frequently stirred it so all the rice would get equal heat and moisture. Constant stirring also helps break down the starch in the rice to give it that creamy consistency thats so good! This receipe is wonderful. I didn’t have any Arborio rice on the spot so I substituted with jasmine rice... it was phenomenal. Newly vegan, I was searching for quick recipes I could make for dinner (and lunch the next day) for myself after I already made the husband and kids a non-vegan dinner. This is one I WILL DEFINATELY make again. And, I’m sure if I served it to my husband tonight he would have never know it was vegan and he would have asked for seconds! : ) Thanks for sharing this recipe!!! 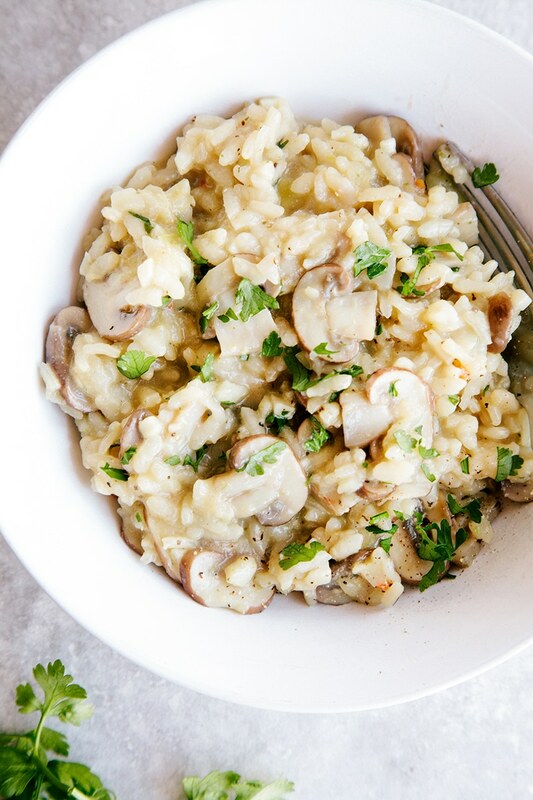 Where do you find plain, uncooked risotto? I have been to three stores, including Whole Foods. 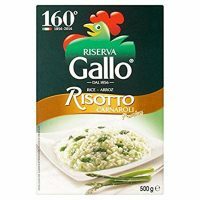 Try looking for Arborio Rice which is the rice used in Risotto. The recipe should actually say arborio. I saw this recipe and decided to make it for my newly vegan 15 year old daughter. I was so hesitant about nutritional flakes, but I’m so glad I bought them!!! It added such a Parmesan cheesy flavor. My daughters stomach gets so upset with cheese, but she misses it so much. This was the PERFECT substitute and so easy to make. I followed the directions exactly and it was perfection. Thank you!! Nutritional yeast is also a good source of b12 for vegans. Its good to sprinkle on her food daily! I think the stock I used was too strong, it overpowered the risotto. Next time I will reduce the stock by a half cup and add white wine instead. I am certainly keen to try this again with a few personal tweaks. Can't wait to try this! It looks so tasty. Thanks for sharing! I've been trying to eat more mushrooms! Made this today for lunch as my first vegan meal and absolutely loved it! So much flavour without any animal products, it's amazing. 5 stars, would definitely recommend to anyone even anyone who isn't vegan! 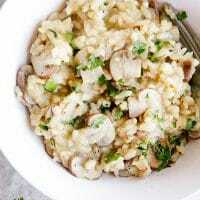 The best vegan risotto recipe, I have tried. Thanks for sharing it. Absolutely gorgeous this risotto, best one we’ve made .....does anybody know the calorie value? I loved this and yes it was soo soo soo creamy! We didn't add anything extra and tbh it didn't need anything more. This is such an awesome and easy recipe to make, definitely one to save. I increased my portions a little so myself and my husband could take it for lunch. Thank you soo much for sharing. Can't wait to try the other recipes on this website! Will this work for 6 servings if I triple the recipe? I just know that usually you add liquid 1/2 cup at a time so just worried if I add a lot of liquid it may get mushy. What about this recipe makes it creamy? Has anyone tried making a crockpot version of this? I just made this tonight, soooooo easy and delicious! Took no time to prepare and the risotto literally looks after itself. I didn't add the yeast flakes and added chopped silverbeet to the mix (because it was sitting in the fridge). After adding the hot stock, mine literally cooked to perfection in 20 mins. Added walnuts on top to be fancy haha. My flatmates loved it too! Try this recipe, its so easy! Simply delicious!!! Just made this for my vegan wife. I doubled the recipe to make enough for 4. I used the absorption method adding a cup of stock at a time. I also topped mine with a bit of finely grated cheese. (Im not vegan) Was delicious and my wife loved it. Will definitely make it again! Thanks. Well that makes me very happy to hear! Thank you for that comment, Dana :-) Let me know if you have any recipe requests or need any tips on making the transition easier. I just made this recipe with Quinoa instead of risotto rice. It's good, but I definitely think it would be better with risotto. I also left out the white wine vinegar and feel like it could have been helpful in adding a little depth to the flavour. So yummy, though. I'll definitely make it again. Comfort food! Yes, I like quinoa but can't imagine it working too well with this recipe. Glad you enjoyed it anyway! Made this last night. So easy! And guess who ate all the leftovers? Yep me! Such an easy recipe to make. I ended up with extra. I wonder if this recipe can be frozen? Great vegan risotto, an amazing recipe with style. Thank you for sharing this incredible dish with us. I made this and it was super good. I didn't use the nutritional yeast flakes. Plus I added a can of white kidney beans for added protein. This was what we had for dinner. Going to make this again. It's good! Only just enough for two, with bread and salad on the side. I will definitely be making this again, but I'll probably use 150g of rice next time. A mazing!!!! This was sooo good, could have licked the bowl! Haha! So happy to hear that :D Love the addition of coconut milk. Hi I'm cooking this tonight it looks declicious! I want to thank you for using measures in your recipes, for those of us in the UK who aren't familiar with the cup system it's a life saver, I find so many recipes that I'm put off trying because I can't convert them with confidence. Loved this! Added some lead and a dash of lime juice and it was delicious See this as a great base risotto for any beg!!! Absolutely delicious! I found it needed a little extra stock to cook the rice because I didn't use white wine. will definitely cook again!! Just made this! So delicious! I put a lot of pepper in mine(I love the taste) and it turned out so well! And I love that it isn't so heavy/doesn't leave me feeling bloated after! This looks incredibly delicious. 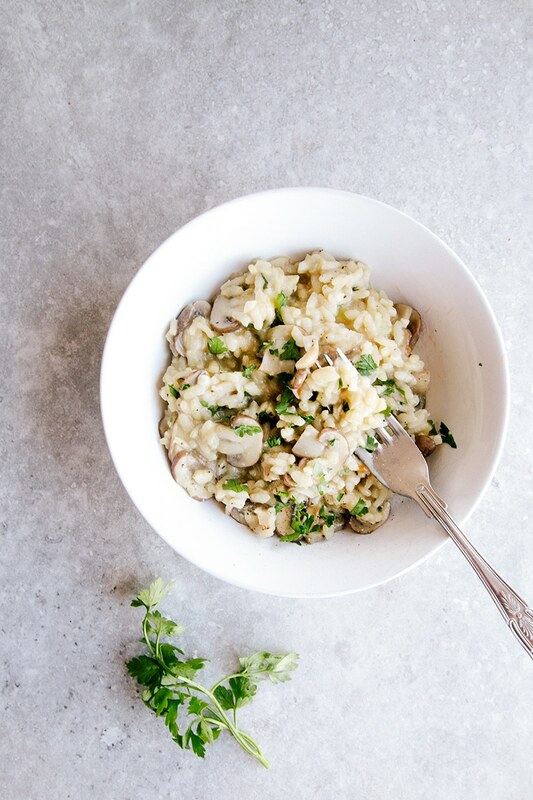 I adore mushroom risotto and I haven't made it an a long time. Your recipe looks quite straight forward so I'm looking forward to trying it. Mushrooms and garlic, yum. Love the recipes but can't stand all the advertisements that pop up constantly on your website. So won't be persevering with your recipes. Hi Lisa, sorry to hear that but what do you mean by pop-up? Are you on desktop or mobile? I shouldn't have any pop-ups but I do have mobiles in my sidebar and within the content. I need these to be able to afford to run my site but if they really bother you, you can install an ad-blocker on your browser which will prevent it. Please let me know if you see pop-ups though so I can report them to my ad company. Thanks! It makes me so happy to hear that, Carole! Thanks for letting me know you enjoyed it :-) One of my favourite dinners. As a uni student I'm always looking for simple but yummy recipes and this was perfect! It's really easy to make and adjust slightly for your preference, for example I used butter instead of oil as its slightly creamier, and next time i might add some diced spinach! Really lovely recipe! Thank you my dear, one of my all-time favourites! Aw thanks for saying that, Rebecca!